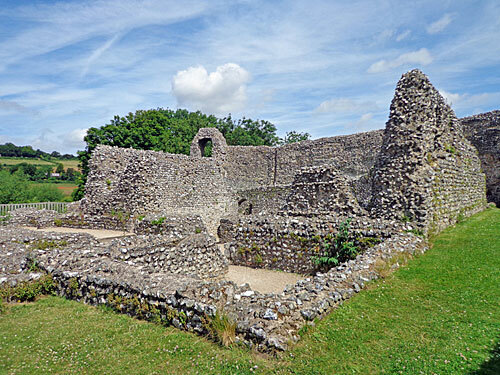 1) Eynsford (3 miles) The ruins of a Norman fortification, some of whose chunky flint walls have survived. Entrance to the main enclosure is via a wooden bridge above a deep ditch through a gap in the massive curtain walls. The hall and kitchen are still clearly delimited. A few sets of steps descend into lower level rooms. Best visited as part of a wider exploration of the picturesque Darent Valley, including a trip to Lullingstone Roman Villa and/or Lullingstone Castle (which is not a castle). 2) Windsor (4 miles) There are good reasons why Windsor Castle is so popular, not just because the Queen lives there and allows visitors inside but also because it's so very close to the capital. Expect to battle past tourist hordes, but everyone deserves the chance to peer round the State Apartments and inside St George's Chapel at least once in their lives. 3) Hertford (7 miles) Pre-Norman motte and bailey beside the River Lea, whose sole surviving castellated building is actually the Tudor gatehouse, which is now owned by the council. Monthly guided tours have dried up in favour of becoming a wedding/events venue, but you can still sit outside on the motte. Queen Elizabeth I once brought parliament here. Locals now bring sandwiches. 4) Hever (7 miles) Cracking double-moated castle, essentially a walled bailey surrounding a Tudor house. Its big claim to fame is that it was the childhood home of Anne Boleyn. Set amid gorgeous landscaped gardens, including a big lake and a hedge maze and occasional jousting, which is how they get away with charging so much for entry. 5) Berkhamsted (10 miles) Substantial remains of an important motte and bailey castle dating back to the 11th century, including walls, ditches, earthworks and a lot of empty grass. Once controlled the northern approach to London and was owned by Thomas Becket. You've probably seen it out of a train window on a journey out of Euston, close to Berkhamsted station. 6) Tonbridge (11 miles) Upgraded motte and bailey, whose twin-towered gatehouse was completed in 1260, and looks a bit like the one at Caerphilly. The great seal of England was temporarily kept here during one of Edward I's visits to France. Only the gatehouse survives, and you can take an interactive audio tour round its restored rooms any day of the week. Council-owned, as is the adjacent parkland. 7) Hadleigh (12 miles) Evocative ruins on a rare hilly outcrop overlooking the Thames and Canvey Island. Two drum towers and a bit of barbican remain. Good for mild clambering, or tiring out Essex kids, or for the view. Adjacent to the site of the London 2012 mountain bike course. 8) Guildford (12 miles) The castle is "open to visitors and has a small gift shop", according to the council website. It started out as the usual motte and bailey, but later a stone keep was added, then a Great Hall courtesy of Henry III. That's long gone, but visitors can climb the restored Great Tower for panoramic views across the town (or wander round the municipal gardens at any time). 9) Rochester (14 miles) A sturdy guardian beside the Medway, the 12th century stone keep is one of the best preserved in England. Much besieged during the reign of King John. A series of spiral staircases and passages permits vertigo-inducing exploration, from the deep cavernous cesspit up the multi-storey levels to the rim of the castle ramparts. 10) Upnor (15 miles) There's no point me writing about Upnor, on the banks of the Medway, because someone will no doubt chip in with a closer castle they think I've missed, which means this castle'll drop out of the top ten and I'll have to delete all this text, so why bother? Also, I've never been, yet.